Ethics and International Relations, Second Edition, offers a comprehensive introduction to the philosophical issues raised by international politics. Presupposing no prior philosophical knowledge and deliberately avoiding the use of technical language, it is ideally suited for political philosophy, applied ethics and international relations courses. Revised and updated, new material includes coverage of the war on terror, the impact of globalization, and ideas of cosmopolitan governance. Gordon Graham is Henry Luce III Professor of Philosophy and the Arts at Princeton Theological Seminary, having previously been for many years Regius Professor of Philosophy at the University of Aberdeen. He has published many books and articles in aesthetics, moral and political philosophy and applied ethics. In addition to his academic publications he has contributed many articles to newspapers and magazines, and broadcasts regularly on BBC radio. From Vienna to Versailles–The Rise of the Nation State. Federalism and the International ‘State of Nature’. The Law of Nature and Nations. 2. Realism, Morality and Law. The Hobbesian State of Nature. National Interest and Moral Responsibility. Moralism and the Domestic Analogy. The Principle of Double Effect. 4. Weapons of Mass Destruction. Threats, Bluffs and Conditional Intentions. Intervention and the Challenge to Legalism. Autonomy and the Nation State. Non-intervention and States as Persons. Intervention and Just War Theory. Intervention, the Rule of Law and the Duty to Intervene. 6. Terrorists, Guerillas and War on Terror. Torture and the War on Terrorism. 7. North and South, Aid and Trade. Taking Stock of the Arguments. Social Justice and Welfare Rights. Basic Rights, National Boundaries and International Justice. Aid and Trade: the World Bank and the WTO. 8. Globalization, Cosmopolitanism and the Environment. Globalization, Environment and International Relations. 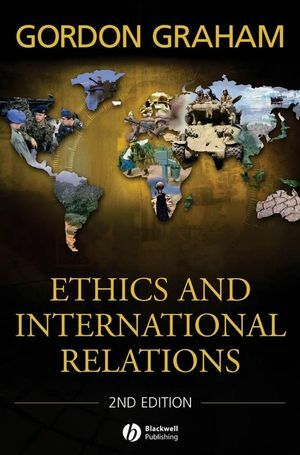 "Ethics and International Relations is an excellent introduction to this important subject. With unusual clarity, Graham tackles all the main topics, from sovereignty to global warming, examining popular opinions and academic theories in a way that will bring newcomers quickly up to speed."